This Hawkwind disc has a bit of a different sound than some of their other albums had. There’s almost a punk rock edge to a lot of it. For my money, that doesn’t work completely well for the group. 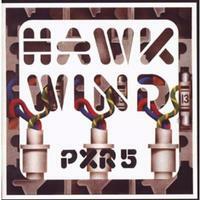 Still, when it’s Hawkwind even if there’s a bit of something that’s not all that effective, it’s still a great disc. I have reviewed a few of the tracks on the set previously on compilation album reviews. For the sake of consistency I’ve adapted those reviews for use here. This cut has a gritty rock and roll texture that is embellished with space rock elements that top the arrangement off. There are some of the elements heard in the opener here, but this has more of a cheery psychedelic texture to it. There’s a keyboard dominated segment here that actually makes me think of Rick Wakeman. This is a space age, tongue in cheek space rock number in classic Hawkmodes. A much harder rocking tune, this has a killer groove and some definite Eastern musical elements built into it. There’s a jam mid-section that calls to mind Hall of the Mountain Grill a bit. I particularly like the little spoken section featuring the robot. I also like the fact that the three laws of robotics are mentioned in the lyrics. A noisy blast that calls to mind early Pink Floyd ends this. This is a progish, fairly hard-edged song that is dramatic and powerful. This track really seems to combine a lot of the sounds heard previously on the disc. It’s got great space science fiction lyrics. There are several twists and turns musically and this is arguably the best song on the set. Here we get the first bonus track of the disc, and it’s a live recording (well live in the studio) of the track that showed up earlier on the album. It might actually be stronger than the main rendition. Another bonus track, this is bouncy and pretty cool. It’s all about the joy that people find in scary movies and scary stories. It’s quite a fun song and a great addition. Like the bonus version of “Jack of Shadows,” this is a rendition recorded live in the studio. It’s also at least as strong, if not stronger, than the main album version. Here we get an alternate version of the song from the album proper. This is strong and I don’t hear a huge amount of difference. As you might gather from the parenthetical, the key difference here is the vocals. It’s a good tune, no matter who is singing. This version has the vocals up further in the mix. I prefer the original mix to this, but it’s interesting anyway. Here we get another alternate take. The final bonus track is a live version of a different Hawkwind title track. It’s a killer version and one of the best things in terms of the bonus material.